2019 Colorado Economic Forecast is here! 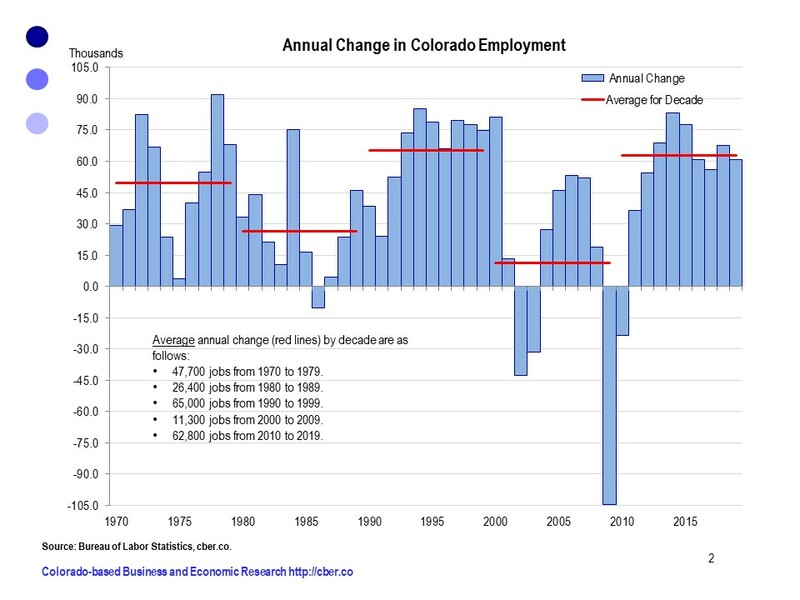 To get all the details, click here for a copy of the 2019 cber.co Colorado Economic Forecast. Global real GDP will increase by 3.1% in 2018. U.S. real GDP will be 2.6%. The U.S. will add 2.0 million workers. Job growth will be driven by Construction: Accommodations and Food Services; Professional, Scientific, and Technical Services; Health Care, and Retail Trade. Colorado Economy – In 2019, The Colorado economy will mirror the slowing in the global and U.S. economies. Real GDP – The Colorado real GDP growth rate will be greater than the U.S. rate and will be driven by health care, real estate, and the extractive industries in 2019. Net Migration – Net migration has trended downward since 2015. The natural rate of increase in population will remain flat as a result of the decreasing fertility rate. Employment – Colorado job growth, 2.2%, will be less than 2018. Unemployment – The unemployment rate will increase to 3.3%. Lack of Trained Workers – The Colorado economy is not operating efficiently because the unemployment rate is too low. There are not enough qualified and trained workers in many sectors. Colorado’s Three Economies – There are three economies in Colorado: Front Range, micropolitan areas such as Durango, and rural Colorado. It is an understatement to say that many rural counties are significantly challenged. Retail/Accommodations and Food Services – Retail trade and the AFS sector are evolving, in part because there are too many firms. Sales growth will reman solid, but employment growth will be modest. Construction – Construction along the Front Range has benefitted from the warm and dry winter, but it has been constrained by the lack of qualified workers. State/K-12 – State government and K-12 education are likely to see significant job growth in 2019. Weather – The weather will continue to have a significant impact on the tourism, agriculture, and construction industries. Inflation – The Colorado inflation rate will decline; however, it will be greater than the U.S. rate. Future Economic Drivers – Welcome to the Spaceport and Gaylord – economic drivers of the future! In addition, companies such as Lockheed continue to secure business that make Colorado a leader in technology. Legislature – As has happened in the past, there is likely to be overreach in the legislature. Important issues will be addressed, but it is unlikely that critical needs, such as transportation will not be adequately addressed. The 2018 Forecast called for 54,000 jobs to be added in 2018. Click here for the forecast. Click here for an abbreviated version of the forecast. • Global real GDP growth will increase by 2.9% in 2017. • 2017 U.S. real GDP growth will be in the range of 2.1% to 2.5%. • There were be an increase of 1.9 to 2.1 million U.S. employees in 2017 – down from about 2.5 million in 2016. • In 2017 Colorado will see job growth in the range of 57,000 to 63,000 workers (2.2% to 2.4% growth). • Growth will be broad based and driven by the Health Care, Accommodations and Food Services, and Construction. Click here for a copy of the 2017 cber.co Colorado Economic Forecast. • Global real GDP growth will increase from 2.5% in 2015 to 2.8% in 2016. • 2016 U.S. real GDP growth will be in the range of 2.3% to 2.7%, about the same as 2015. • There were be an increase of 2.7 million U.S. employees in 2016 – down from about 3.0 million in 2015. • In 2016 Colorado will see job growth in the range of 67,000 to 73,000 workers (2.7% to 2.9% growth). • Growth will be broad based and driven by the Health Care, Construction, and Accommodations and Food Services. 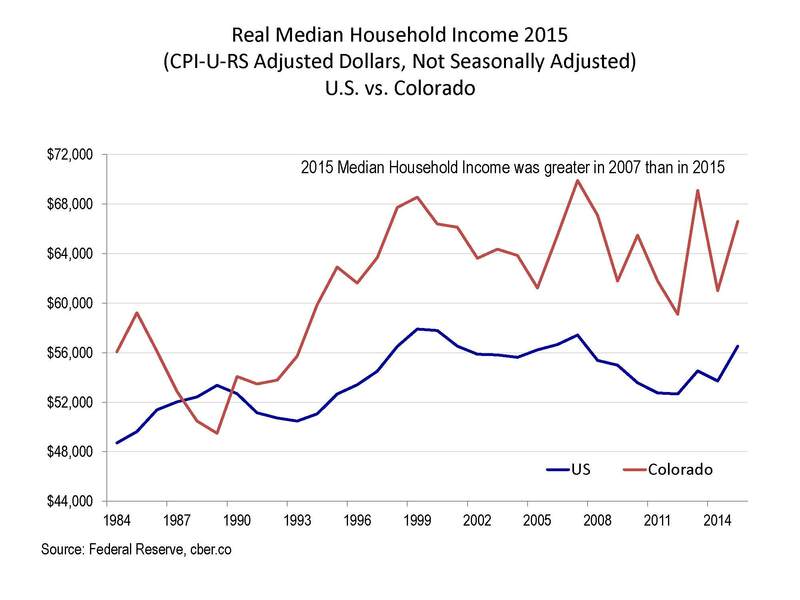 Click here for a copy of the 2016 cber.co Colorado Economic Forecast. Real Global GDP growth will increase from 3.2% in 2014 to 3.4% in 2015. U.S. Real GDP growth will be in the range of 2.5% to 2.9% for 2015. There were be an increase of at least 2.6 million U.S. employees in 2015. In 2014 Colorado will see job growth in the range of 73,000 to 79,000 workers (3.0% to 3.2% growth). Growth will be broad based driven by the Construction; Health Care; Accommodations and Food Services; Professional, Scientific, and Technical Services, and Retail Trade Sectors. Click here for a copy of the 2015 cber.co Colorado Economic Forecast. Click here for a copy of the recalibrated 2015 cber.co Colorado Economic Forecast. 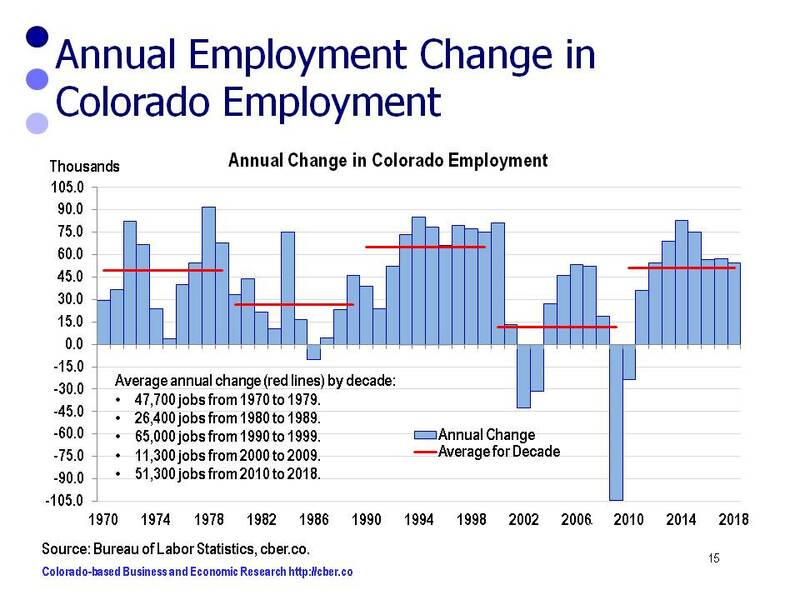 The original forecast was updated to account for significant benchmark revisions to the 2014 Colorado employment data. •U.S. Real GDP 2.3% to 2.7%. •The U.S. will add at least 2.3 million workers. •Colorado will account for 3.0% of U.S. jobs added. •Colorado will add 68,000 to 74,000 workers. The Federal Government will be the only sector to shed jobs in 2014. Originally, Healthcare was listed as a leading sector. In March 2014, the size of the healthcare sector was diminished as several private sector organizations were purchased by state organizations. As a result, the 2014 cber.co projections for healthcare job growth will be less than anticipated. Click here for a copy of the 2014 cber.co Colorado Economic Forecast.